Thanks to a new, strategic partnership with fast-growing Aftercare Response, customers for Highway Care’s light arrow and crash cushion packages are being offered extended, three-year warranty cover, and comprehensive service support which includes round-the-clock breakdown assistance. It is the first time that a manufacturer of road safety equipment of this kind has been prepared to back its products for such a lengthy period – the industry standard is a 12-month warranty. Key to Highway Care’s confidence in doing so now is the expert, timely back-up which its customers can expect to receive from Aftercare Response’s team of 50 field-based engineers. It is they who will deliver the new maintenance and repair programme, which comprises scheduled six-monthly services and emergency 24/7/365 breakdown cover. The engineers have undergone full product training at Highway Care locations in Kent, on Merseyside and in the Midlands, on its Safe-Stop™ 90 HD crash cushions, light arrow and lorry-mounted crash cushion (LMCC) packages. LMCC systems are designed to minimise the effects of a vehicle colliding with a maintenance truck. By absorbing energy from impacts they help to protect occupants, while also dramatically reducing damage to vehicles, and in some cases preventing it altogether. Coincidentally, both Highway Care, which operates from headquarters in Maidstone, Kent, and the West Midlands-based Bevan Group – of which Aftercare Response is a part – have been celebrating their 40th anniversaries this year. 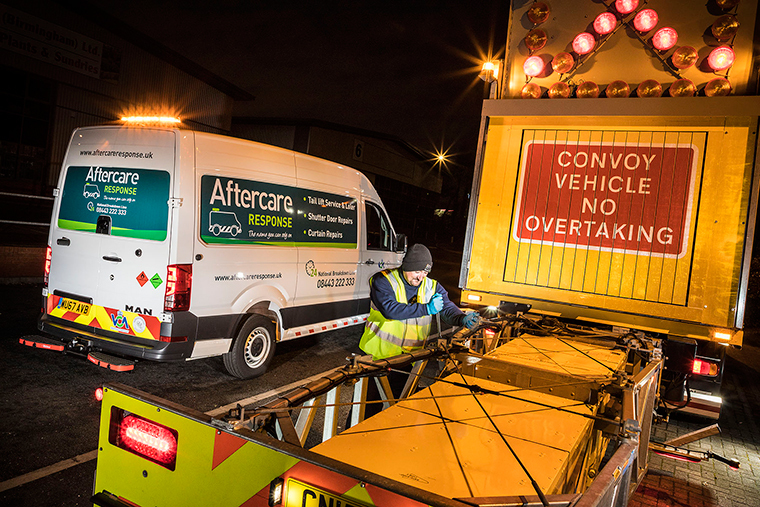 Aftercare Response provides commercial vehicle operators nationwide with planned and emergency support covering ancillary equipment such as cranes, tail-lifts and roller shutter doors, as well as bodywork of all kinds. They are managed by a team of 27 operations controllers based at the Bevan Group’s new headquarters in Wednesbury. The philosophy at Aftercare Response is all about getting the job done, whatever it takes, to keep its customers on the road. A highly successful division of the multi-faceted Bevan Group, Aftercare Response provides a comprehensive portfolio of maintenance and repair services covering truck and van bodywork, and ancillary equipment. Between them, its highly-trained engineers work on an average of 250 vehicles every day. Much of this is scheduled maintenance, undertaken at customers’ premises, but the team also provide round-the-clock breakdown cover, typically reaching the scene within 90 minutes. Highway Care’s Mobile Traffic Products division has been at the forefront of innovation and engineering products for the traffic management sector for 40 years. Priding themselves on being able to offer viable, approved and industry-compliant solutions that have stood the test of time, the Highway Care team’s vehicle-mounted products and services are widely regarded by their customers as being superior in performance and reliability, even in the most demanding situations.